Gorilla glue is a kind of marijuana strain and is considered as one of the most demanded strains in the United States when it comes to cannabis market. It first appeared in 2013, and since then, it has taken the industry of medicine by storm. The appearance of Gorilla Glue comes with a hybrid of medium-density, and it finishes with a color of very light green in calyxes. The flower of Gorilla Glue comes with sweet hints and sharp sourness and may vary depending on its batch. Flowers that are burn can produce a strong skunk perfume which can be very thick in the air. Others nearby can entice with the smell and will probably ask you what you’re smoking. The Gorilla Glue is bred to produce a maximum amount of THC. 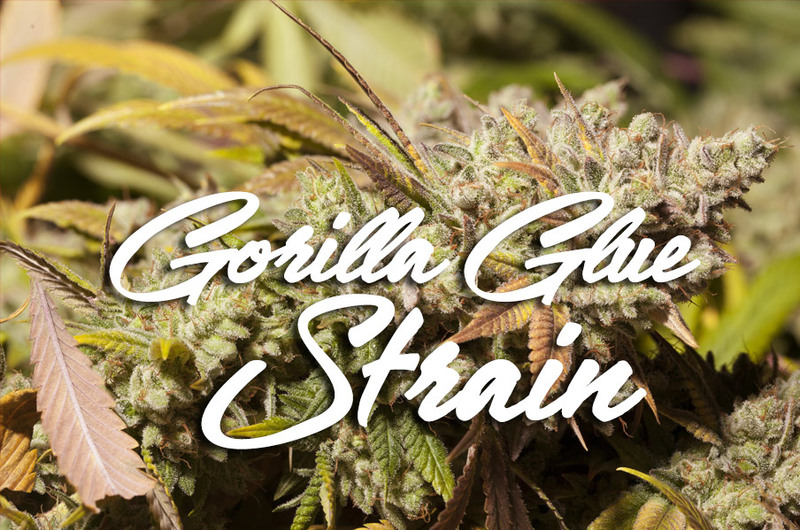 Gorilla Glue’s flavor can be muted and can be indistinguishable compared to other strains. This does not mean it has a bad taste, but it does not contain a diverse pallet which a lot of strains have. The Gorilla Glue is not an ideal strain for a sleep aid because it has a racing effect which will then ease into stoniness after feeling the initial rush. This kind of effect can be seen to a lot of OG varietals. It is sometimes associated with an early onset of rush which can be euphoric and a relaxation that can ease for hours. Gorilla Glue can be an ideal choice for some symptoms such as pain management, and it can also trigger an apatite simulation. There are different phenotypes that are associated with Gorilla Glue. But we will just discuss the most commonly used which is the Gorilla Glue #1 and Gorilla Glue # 4. Gorilla Glue #1 is an ideal choice of strain if you need a powerhouse. It is very delicious, and a hybrid that is indica-dominant, which is very popular on the West Coast. This kind of strain produces a relaxing high and can cause a deep sleep. This can also produce a blissful euphoria and happiness. This is an ideal choice if you are experiencing with insomnia, chronic pain, or appetite loss. The most famous strain in the Gorilla Glue is Gorilla Glue #4. Gorilla Glue #1 only comes second and is considered as an early rendition of the most top strain. All Gorilla Glue strain can be very heavy-hitting, and Gorilla Glue #1 can produce a much more sedative effects compared to others. The THC levels of #1 and #4 can be comparable. A test showed that Gorilla Glue #1 produced a THC of over 28%. Gorilla Glue #1 can provide a sedating strong experience. Although the #4 can have a heavy-body of sensation, Gorilla Glue #1 amplifies these characteristics. This kind of strain will likely give an effect of being less happy, and a clear-headed feeling of euphoria. You can also experience a little bit drowsy, and a narcotic kind of tranquility feeling. This kind of strain is ideal for nighttime or evening, and it is recommended to take it before a big meal or as a nightcap after having a long day. Unlike other strains, this has euphoric and cerebral qualities. If you want to hold and keep an interesting conversation, consuming a Gorilla Glue # 1 is a great choice. High doses of this kind of strain can put you to a deep sleep. This kind of strain offers an engaging and thoughtful feeling of highness and a deep sense of relaxation. This kind of pungent flower can be difficult in passing up. This is ideal use during afternoon or evening. The Gorilla Glue # 4 is considered as one of the strongest kind of strains of all time. This is also a multi-award winning strain, and it can provide users with a heavy-handed feeling of highness which can affect the whole body and mind. The Gorilla Glue #4 has a high amount of THC which is about 30%. Users can experience a psychoactive feeling that ranges between 18 to 25%. The strong potent which is the pine aroma can be a good reason why this strain is very strong enough. It also has thick coatings of trichomes which covers the buds. This kind of strain is an award-winning bud from GG Seeds. Among the Gorilla Glue family, this kind of strain is considered as one of the most impressive ones in its generations. Besides being the most potent, it also produces a lovely and great high that really hits and sticks hard. The Gorilla Glue #4 is one of the buds that you can be fond of because of its desiring effects. This strain can provide a powerful high and is perfect for anyone who already knows everything about the cannabis. The effect can come in a bit of a rush, and sometimes give pressure in your eyes and your sinuses. If you consume this in high doses, you can have a feeling of little introverted and pensive. This is probably because of the very powerful cerebral activities that the Gorilla Glue inspires. Others take advantage of its stimulating experience to finish up different activities such as chores in the house. Overall, this family of the Gorilla Glue can give you a vibe of a happy, sleepy, and relaxed feeling.